a great project in several parts. The first part was to develop these 14′ tall interactive towers. The metalwork was conceived and designed by Mad Systems, with a mechanism that resulted in a fully hidden set of hinges, and a lightweight lockable door structure that houses the necessary equipment. Slim, and designed to be strong enough to withstand the kind of visitor interaction that one would expect, these towers have now been up for a few years and they are behaving well. The towers are locked down top and bottom, although alternative methods of handling these units are possible. The entire screen is a touch-screen, and the front is gorilla glass, mounted on the slim-line monitors inside of the unit. Access is available through the front and through the back through the full-size doors, and the result is a clean and beautifully simple looking set of monoliths. 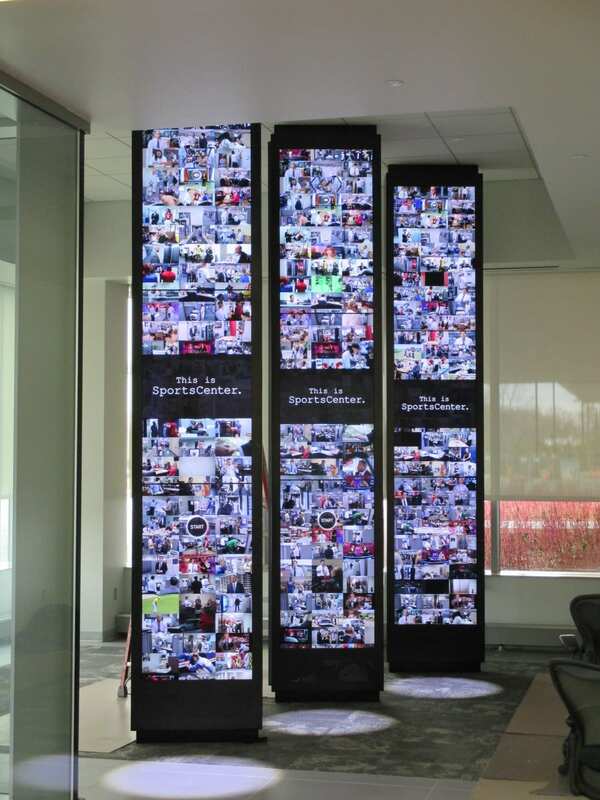 The brief for the 14′ tall interactive columns was to allow visitors to access one of the well over 400 ads that have been produced by SportsCenter and that are loved by all sports fans. We started with the attract loop, shown in this image, where 90 individual and randomly selected ads are shown simultaneously – quite a unique feat in itself. 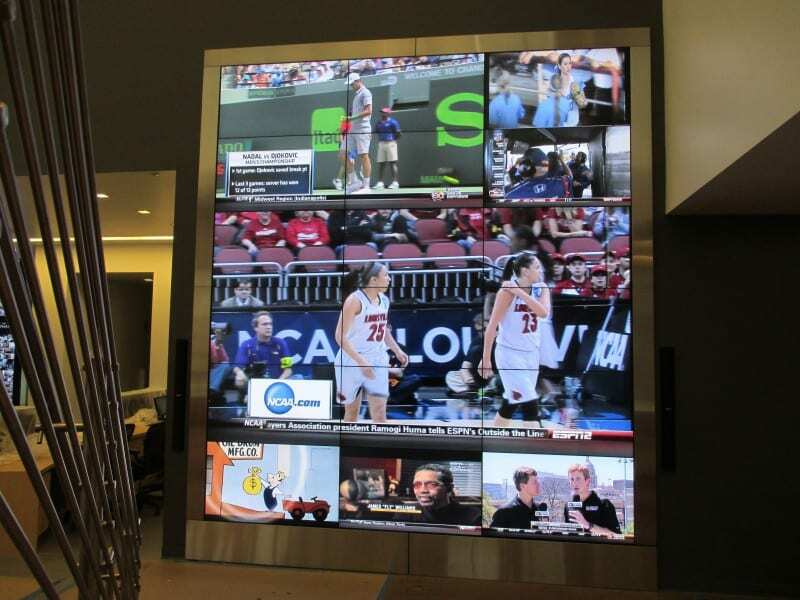 When a visitor touches the screen, the spotlight in front fades down as the videos cascade down revealing a secondary video presentation that actually allows visitors to do their selection based on sports, date, or personality. A lot of fun is had by all as they find and view their favorite spots. A second exhibit, also implemented using video, is this split-flat board simulation, reminiscent of the types of message boards that used to be seen at railway stations and airports. Mad designed the individual elements using 3D studio max, so that all the transitions between letters were set up cleanly, and then created the audio file from original split flap board audio. 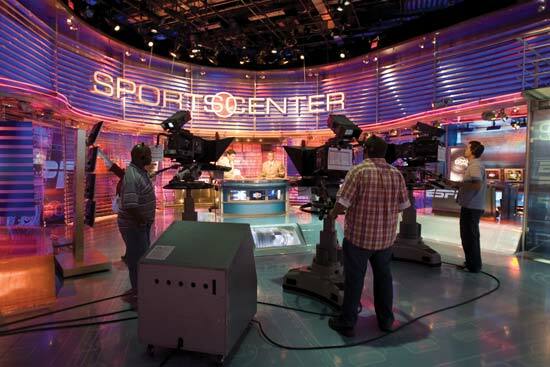 The resulting exhibit is connected to the ESPN scheduling system, and reads the status of the studio lights at the four main studios in DC-2. 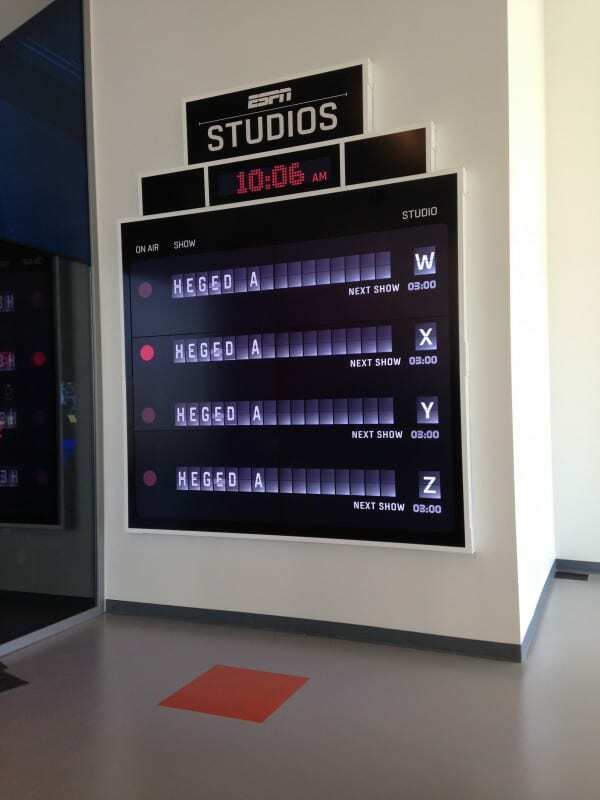 The result is an exhibit that tells visitors what show is showing where, and what show is next – and since it gets data from the central scheduling computer, the result is fully automated. Faux red ‘lights’, again implemented in video, turn on and off based on the ‘live’ lights at the various studios. The faux LED clock on the top is also implemented in video, and the computer picks up the time from the internet making sure that the result is always spot on. 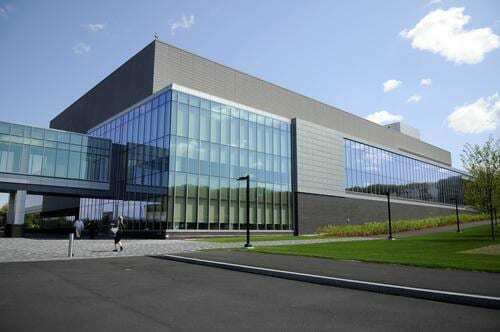 The third exhibit is a large video wall that takes in live feeds from various broadcasts and displays the result in real time. The wall is set up to be as maintainable as possible: each of the monitors can be ‘popped out’ and replaced without having to remove other monitors in the system.